Our supermarket build is in full swing, and it is spectacular! As we prepped for the build, my builders, engineers and architects had tons of ideas, but they directed them only to me – the teacher – even though their peers were sitting with us. So many awesome ideas, and so much potential for collaboration and elaboration, were being wasted! They looked at me. The looks on their faces said “Eee gads? Did you just say, Eee gads! ?” but no one spoke, they just waited. We had at least 8 announcements of “Hey Kindergarten!” in that 30 minute building period. It was a bit overwhelming (at least for me, lol). I thought I might have to figure out something to say to rein them in. But, as the days went by, they began using it more judiciously all on their own. The first time they said that I laughed out loud and said “You’re right! I should!! !” So, I did, and they responded immediately – “Hey, Miss James!” It was awesome. I love that they are teaching each other by sharing their ideas, reflections and wonderings. I love that they are listening to each other. I love that “Hey, Kindergarten!” shares classroom control with them. I love the joy they express when using it. I love hearing them say it, and responding along with their peers. But, i think what I love most is how it empowers them. Their ideas are being told, heard, respected and valued. And, THEY are calling their friends — and teacher — to listen. We are partners in this learning journey. I’m glad to give them a way to experience and express the partnership. The things they have shared after saying “Hey, Kindergarten!” have been remarkable. I don’t think it is coincidental. I think they feel the value, power, liberty, and awesomeness of “Hey Kindergarten!” and it opens them. By the second half of the year, my girls understood addition is putting things together to get more. They understood subtraction is removing things to get less. They were able to use various strategies to solve problems I created. They enjoyed showing their mathematical prowess as they computed the numbers I gave them. But, I wanted more for them. And, in a funny way I wanted more for me. They were always amazing and amusing me with their thinking and creativity in other pursuits – actually, we amazed and amused each other! I wanted to experience that with them in math as well. 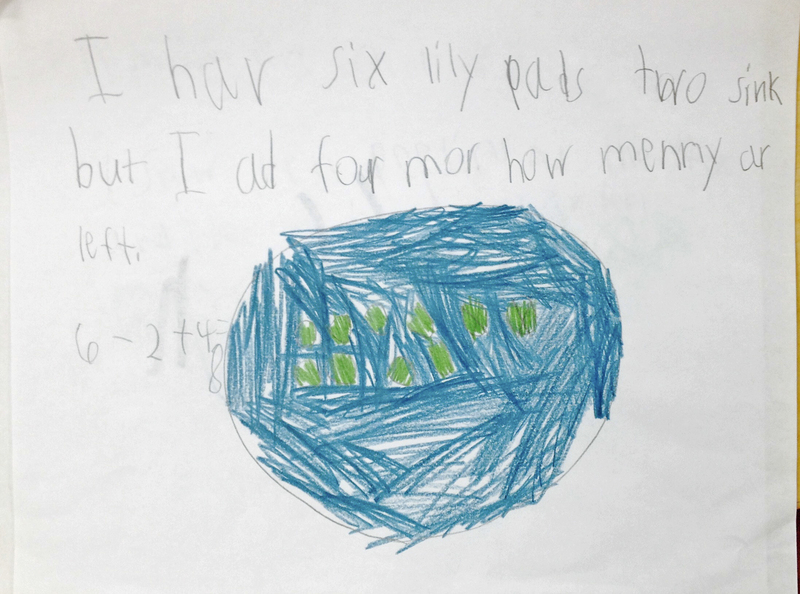 I wasn’t sure how to provoke this creativity, independence and amazement in math. But, believed it could (and should) happen. After letting it “ferment” in my brain for a few days, I had an idea. What if I asked them to create a real life addition problem? 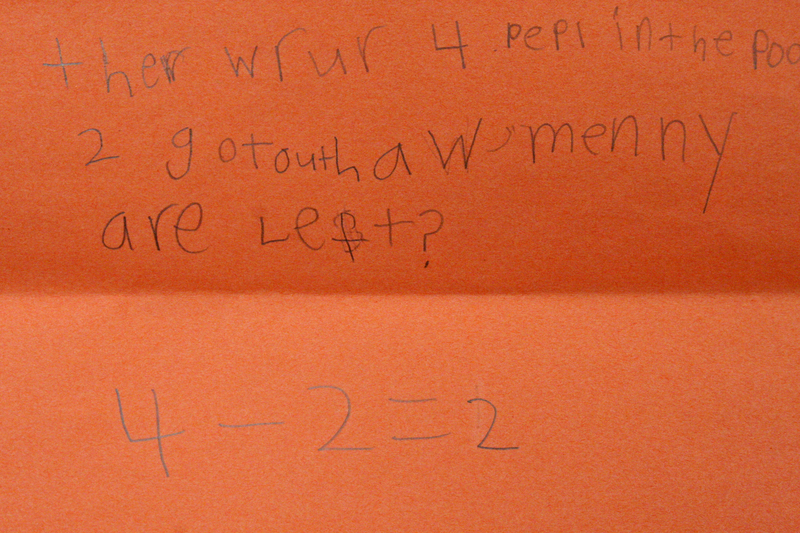 What about a real life subtraction problem? Oh my! What if I challenged them to create a real life math problem that involved subtraction AND addition? Now that would be something! I asked them to think of an addition story. Not just two and two is four, but two of what and four of what. And perhaps most importantly why? 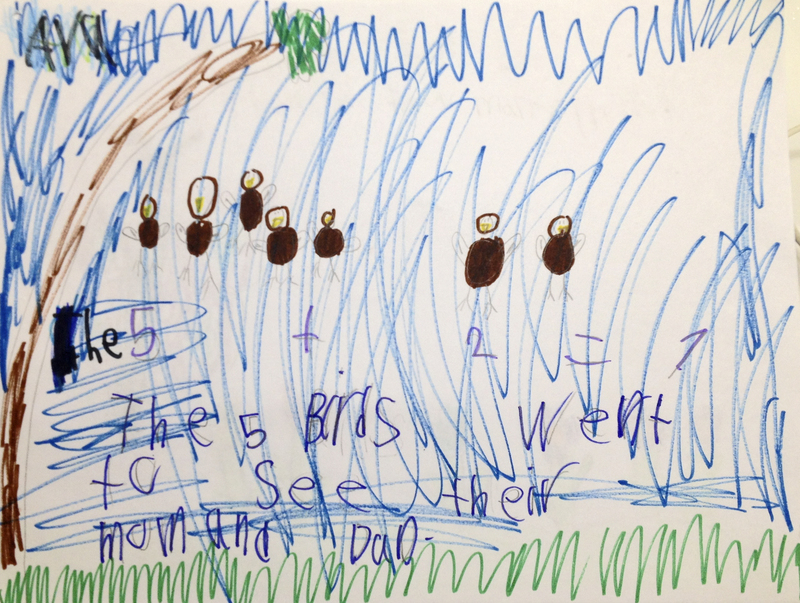 Once they had their story, I asked them to record it in three ways: illustration, word and number. It was fascinating, and fun, to listen to them, talk with them, and watch them work. Next I had them create a “math mystery.” Their pictures were visible, but their word and number stories were hidden (under the flap). When they were ready, they partnered with a friend, shared their pictures and tried to guess each other’s word and number stories. This helped them notice nuances that they missed, or didn’t need, when all the information was before them. For instance, is this 2 people joining 2 other people floating in a balloon (2+2 =4)? Or is it 2 people getting off the rock to go home, leaving 2 people on the rock (4-2 =2)? Two very different scenarios, and depending on your interpretation, either could be true. When differences arose I encouraged the girls to talk with one another. “Ask each other questions. Tell each other what you think and why you think it. Explain your work. Add detail if you think it’s important. Help each other!” What an important and impressive process. Sometimes they agreed to disagree, secure in their explanations. Sometimes they amended their drawings, or noticed something they previously missed and amended their guess. I think they amazed and amused each other. Certainly they amazed and amused me! Hopefully they began to see that math is useful, fun and all around them. So, what did you guess the word and number stories were for the above picture? Blocks are a fascinating medium. They provide endless opportunities for exploration, learning, growth and joy. While they have always been a part of our Kindergarten classroom, this year they are an integral part of our curriculum. 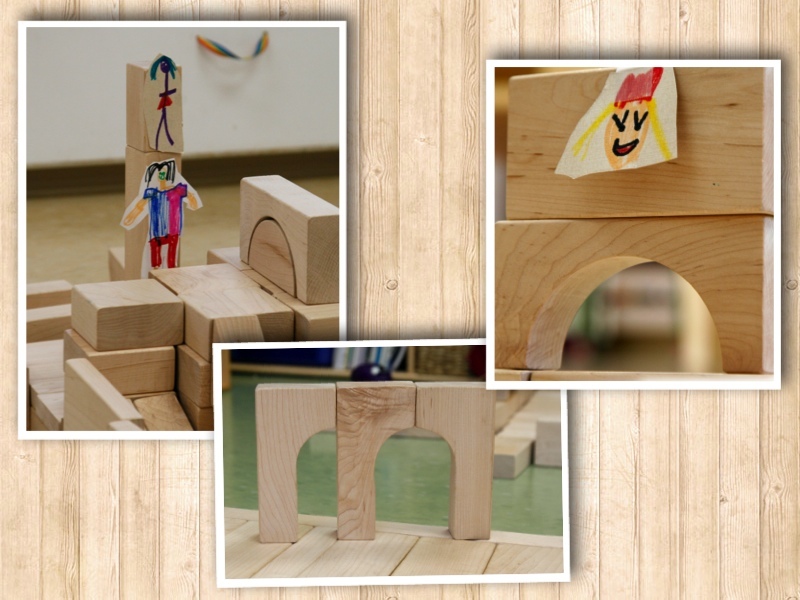 Blocks enable the girls to participate in all three domains of learning – cognitive, affective and physical/kinesthetic. The girls engage in mapping and spatial planning, collaborate with each other as they build, negotiate for space and use of blocks, and finally, when finished, conduct tours, as well as answer questions regarding their designs and buildings. The depth of thought and engagement is fantastic! While building, the girls must think creatively and critically. What will they build? Where will they build? How will they create the various shapes and levels? What if the blocks they want are being used elsewhere, can they create that same block using other blocks? What if their structure is unstable and falls down, how can they re-engineer it for greater stability? Additionally, creative and critical thinking abounds as they furnish their buildings with accessories and special features, and as they create the community of persons who live in, or work in, their buildings. My absolute favorite part of the process is documenting their work through photographs, and conversing with the girls regarding what I see. It is incredible what I see, and don’t see, as I look through the camera. And it is fascinating and fabulous what I learn – about the girls, and their buildings – as I ask questions. Can you tell me about your thinking? How did you make that? Is there any other way you could build that? Hmmm. Could you create a way for …? Oh wow! How did you decide to do that? How did you decide to do it that way? Do you notice the two people? The builder was hesitant to add people to her structure – although it had a multitude of spaces where people would congregate, play, and live. Finally after a bit of conversation, she added the larger figure. I admired the figure, listened to her explanation, and continued to photograph the other girls. When I looked back, I noticed she had added another person … on top of the first person’s head! I chuckled and said, “Is she standing on his head?” She looked at me as though I knew absolutely nothing and said “No, Miss James, he’s giving her a piggy back ride!” I responded, “OH MY GOSH! Of COURSE!!!! I get it now.” How else would we show that? She continued creating people – some standing on their heads, some on their feet, and stacked them 10 high on the original person’s head. Evidently, the circus was in town and the acrobats were staying at that apartment building! Now, do you notice the face with blond hair and a crown? The girl added that to her castle when we were talking about adding people. Hmmm, I thought, I wonder what that is? So, I asked. “Hey, A. What is that? A ghost? A head with no body?” As with the other girl, she looked at me like I was a bit silly, chuckled and said, “No, Miss James, it’s the old queen.” I didn’t get it yet. “The old queen?” She continued her explanation, “Yes, a picture of the old queen, on the wall! Look here is one of the old king!” I laughed and said, “Oh! I love it! Pictures of the people who used to be here. Fantastic! Does someone live in the castle now? Will you be adding them to the castle?” She assured me that she would. Finally, do you notice the doorway (archway) that appears to have two entrances? I loved it as a structure and architectural detail but I was intrigued to know what the girl was thinking when she created it. “M. would you tell me about this?” She launched into a detailed description – complete with a demonstration – regarding the planning, purpose and use of the doors. Evidently there are good and evil people in her realm – of varying sizes. The good people, big and small, can enter the castle using the appropriate opening. But, should an evil person approach the doorway, the single arch magically moves to block their entrance. And, I believe, should they have somehow made it past that safety measure, there was a trap door waiting for them upon entering! Fabulous, isn’t it? Their ability to imagine is quite remarkable, eye-opening and entertaining. But, had I not engaged them in conversation with open ended questions, I would not have understood the depth of their thinking!